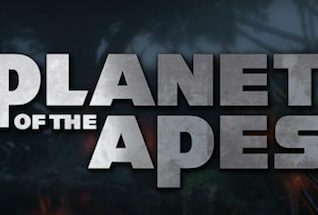 Hollywood blockbuster movies have been turned into some pretty awesome slot games in recent years, and NetEnt’s Planet of the Apes Slot is turning out to be no exception. The game cleverly uses both Rise of the Planet of the Apes and Return of the Planet of the Apes film licenses by creating two slots in one! To the left is five reels and three rows of Rise, and two the right is five reels and two rows of Dawn. That’s right, 10 reels and a promising 40 paylines to admire here. Plus some nifty features that see symbols shift from one side to the other and push more wins. There are five bonus features in the game in all, including three free spins features. You can grab up to 15 free spins and 3,000x your stake in these bonus rounds. The Planet of the Apes slot RTP is 96.33% and the variance is medium. The game is full of exciting video clips and graphics from the films that bring the reels to life. You can play right now on desktop, tablet or mobile at any of our partners sites including Casumo. Or read on for our full game review. 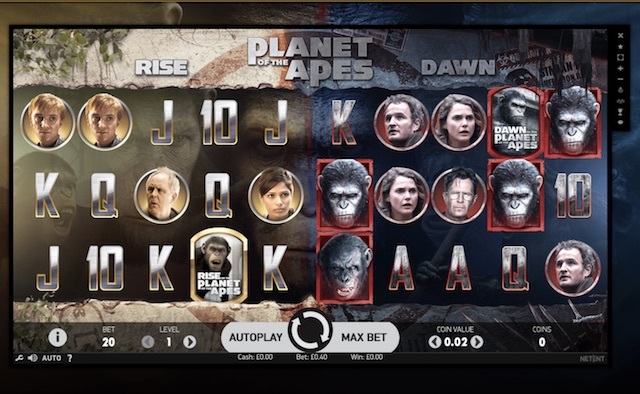 The Planet of the Apes game is divided into two slots that sit side by side, both with 5 reels, 3 rows and 20 paylines, adding up to 40 paylines each in all. The left side of the screen, the Rise reels, are in light, whilst the Dawn side on the right appears to be in shadow. The symbols on the reels are made up of card values from 10 through to Ace, plus some characters from the film, including some pretty scary looking Apes. You can bet up to 20 coins per line and play from 20p to £100 per spin on Planet of the Apes Slot. There is a pretty epic soundtrack to be enjoyed at the same time, although should you wish to play in silence you can switch it off easily enough. Wild – These are the pictures of Ceasar’s attic window. They replace anything except scatters and bonus and complete win lines by substituting. Rise Bonus – Activated by the Rise Bonus symbol when it appears on the first reel. Any ape and human symbol appearing at the same time wins you a further cash prize of up to 79.5x your stake. Dawn Bonus – Activated when the Dawn Bonus symbol appears on the last reel. It morphs all the human and ape symbols into one. You can win 1,200x your stake here. Dual Bonus – Randomly triggered, and one symbol from each reel is selected. These are frozen in place and a re-spin awarded. If one of the symbols lands on the other side it is moved over to the side it is selected on and further re-spins occur. In the Rise slot, if you land three scatters on the same spin you receive 10 free spins. Wilds are collected during the free spins and put in the Wild Meter. Then for the last spin your wilds will be added back to the reels. This can drive big wins if you collect 10 or more. In the Dawn slot, three scatters will trigger 15 free spins. This comes with three additional flaming symbols. When each lands it partially fills a meter. When a meter is full, it triggers that feature – extra spins, multipliers or more wilds. Planet of the Apes is one of NetEnt’s highlights this year. The dual reels is an excellent format and the features seem to come thick and fast. The real big wins come when you can collect 10, 11, 12 or more Wilds in the Rise Free spins round, or when you fill your meters in the Dawn Free Spins round.